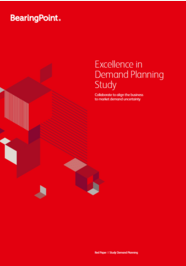 Frankfurt, October 5, 2015 – In the new BearingPoint study “Excellence in Demand Planning,” the authors analyzed the findings from a survey of 168 demand planning professionals on the fit of planning complexity drivers with demand planning maturity in organization, process, methods, KPIs and tools. 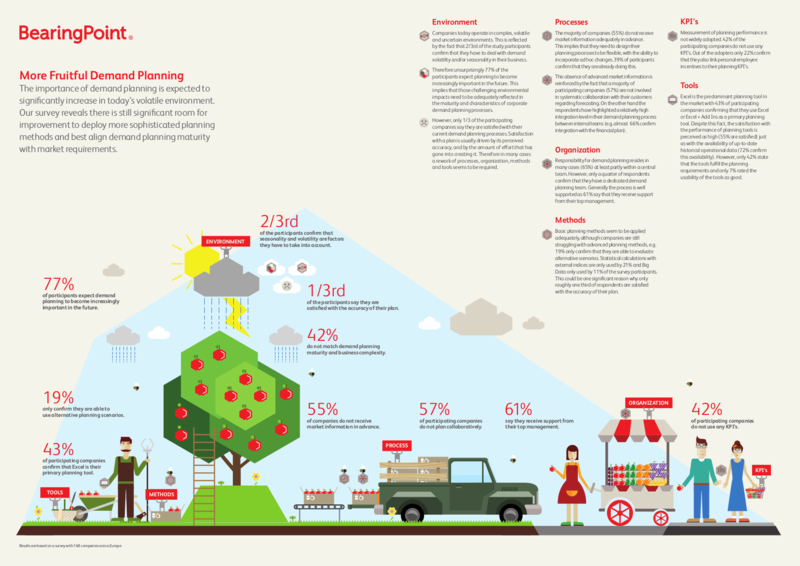 The results show that even though participants expect the importance of demand planning to increase significantly, more efforts must be made at their companies to deploy more sophisticated planning methods: not even half (45 percent) of respondents said that their planning process delivers a realistic plan. Despite the mega trend of digitalization including the use of predictive methods and big data analytics tools for, i.e., the mass processing of customer data for sales planning, according to the study, Microsoft Excel is still the most commonly used primary planning tool. Nearly half of respondents said their companies use either Excel or Excel with advanced functionalities through add-ins. Satisfaction with the performance of planning tools is perceived as high (55 percent are satisfied) as well as with the availability of up-to-date historical operational data (72 percent). However, only 42 percent state that their tools meet planning requirements and only 37 percent rate the usability of the tools as good. Companies of all sizes took part with roughly half (48 percent) of all participating companies generating annual revenues higher than 1bn Euro. The study was conducted across different industry segments. Participants came primarily from different industry clusters with a focus on industrial products (37 percent), consumer goods (32 percent) and automotive (16 percent).